Welcome to the Buffalo Grove Garden Club Website! Stimulate the knowledge and love of gardening. Various meetings have professionals who give a wide range of educational topics on gardening. Members share their knowledge of “how-to” and other gardening ideas. Through speakers and workshops, we learn a variety of arrangements using fresh and dried plant material to encourage artistic use of flowers. The Garden Club has planted and maintained 5 gardens throughout the village. By working with the Buffalo Grove Park District, we have donated trees, shrubs and flowers. The club instituted placing in honor of our military a Blue Star Memorial along with a formal garden. Donations are made toward State wildflower planting programs, a State scholarship fund, and Nature Conservancy. We also offer college scholarships to local students studying in horticulture, conservation and landscape related fields. An annual plant sale to fund our many community projects and yearly Scholarship. In addition to monthly meetings or workshops, we also have a summer garden luncheon, winter holiday party and spring dinner. Check out our community gardens! The Buffalo Grove Garden Club plants and maintains 5 community gardens in Buffalo Grove. 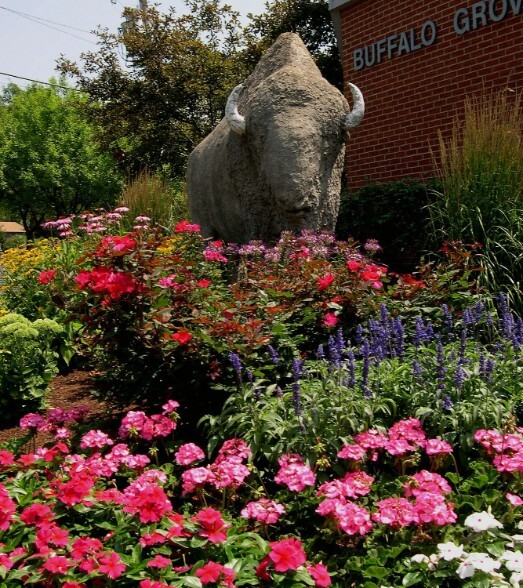 One of our Community Garden Projects - The Buffalo at Lake Cook & Raupp Rd.